Back in February, I saw this call for single button, interactive objects to be displayed at an exhibition called “one button objects,” in San Francisco, as part of the Gamma4 one button game event during the 2010 Game Developers Conference. This presented a perfect opportunity to experiment with interactivity and sensor input for my Electric Window 3 platform. 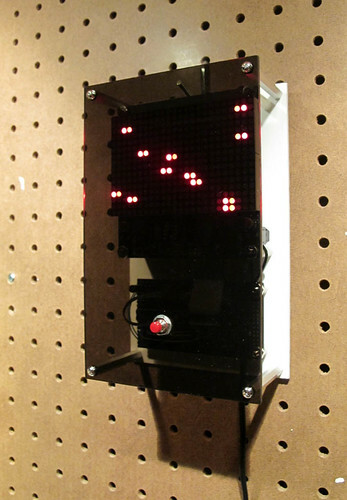 Each time the button is pressed, a new particle (represented by a single LED) is born. The speed of each new particle is based on the average time between previous births. Thus, the system has a form of “memory” shaped by previous users. There are several variants of the particle systems in terms of particle behavior: particles either constantly scroll across the screen and wrap around at the borders; bounce back and forth (or up and down) within the screen; or travel both up and down and side to side, creating the opportunity for collisions. In the latter case, when the particles collide, they both die. 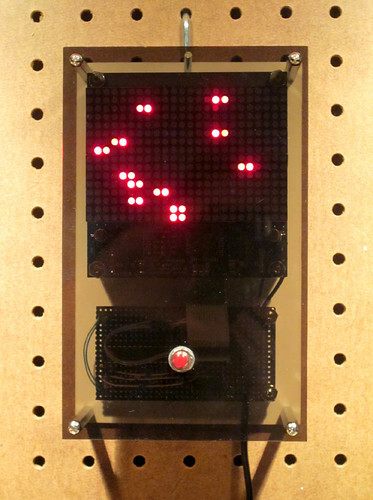 In all cases, the particle system only has room for so many particles, so after a certain number of births (via button presses), the system resets. This teases users to find a balance between a “boring” system of few particles versus creating a busy/dynamic system at the risk of killing the whole thing. The guiding principle was to create an engaging, evolving display from a simple set of rules and user input. The curators — Heather Kelly of Kokoromi and Peter Kirn of Create Digital Music/Motion — accepted the piece into the exhibition which took place on March 11-13 2010 at the Gray Area Foundation for the Arts. I’m now planning to implement particle system animations into future Electric Window 3 fixtures, and more generally, start adding time-based behavior and user input (both direct via buttons etc., and indirect via motion sensors, etc.) to my light fixtures. This work was generously supported by the art funding program of the City of Ottawa.